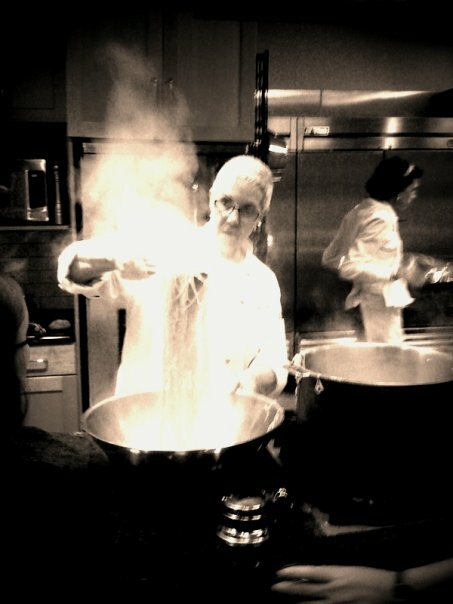 A pasta class seemed like the perfect solution to my problem. Not only do I love pasta, but I could take my new techniques and try my hand at other homemade doughs. When I got to the class I was really excited but a little apprehensive of the fact that we would be making our pasta in groups. I didn’t know how much I would actually be able to make myself. Needless to say the groups were necessary in order to prepare the amazing menu we would enjoy for dinner in just two and a half hours. My group was in charge of making a simple egg pasta with a lemon-butter cream sauce. 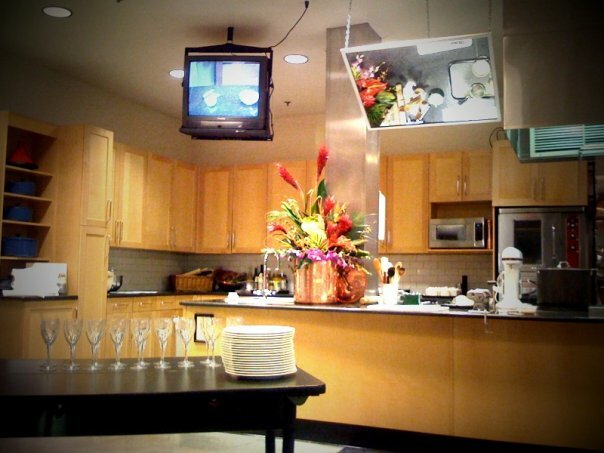 Our stations were prepped with one Kitchen Aid mixer, three pasta attachments, a nifty ravioli press, a separate pasta roller, and already prepared dough. One of the ladies in my group was in charge of the sauce and the rest of use were in charge of cutting the pasta. After a brief demonstration from our wonderful teacher, Linda, I took my spot at the mixer. Working with a quarter of the pasta dough I placed the semi flattened (just with my hand) and floured disc into the flat attachment of the mixer. With the attachment set on one, and the mixer speed on two, my dough was on its way to be becoming thin a beautiful. Working the dough back through the attachment, while turning up the dial each time, I had a perfectly pressed piece of pasta by the time my setting was at 4. Once my pasta was pressed I cut it in two pieces to ready it for cutting. Using both the spaghetti and fettuccine attachments both pieces of pasta turned out some gorgeous strips. Over the next few hours we practiced our skills at our respectable stations and learned how to make spaghetti, fettuccine, and ravioli. 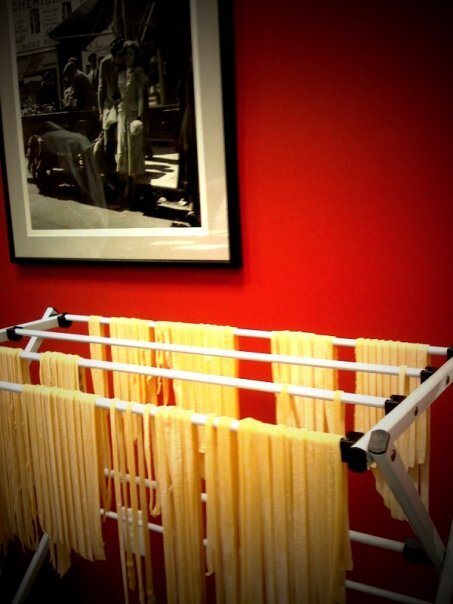 Once all of the pasta was cut and ready for the water we were ready to make our own dough from scratch. Using the marble counter top I dumped my flour onto the counter and with my hands formed a well in the center. Then, I cracked three eggs in the well and scrambled them with a fork. Slowly, I added the flour a little at a time, making sure to incorporate both ingredients. I learned to not use all of the flour, because it’s better to have to add more to your wet dough as opposed to adding too much, resulting in a dry product. Using a dough cutter I continued to incorporate the ingredients until it formed a nice firm ball. Next, I kneaded the dough until it was nice a soft. Through the kneading process I would periodically add some flour so it wouldn’t stick to my hands or the counter. With the blessing of the instructor we were given some plastic wrap to take our creations home with us! The end result of our efforts was amazing! Plenty of delicious white and red wine! 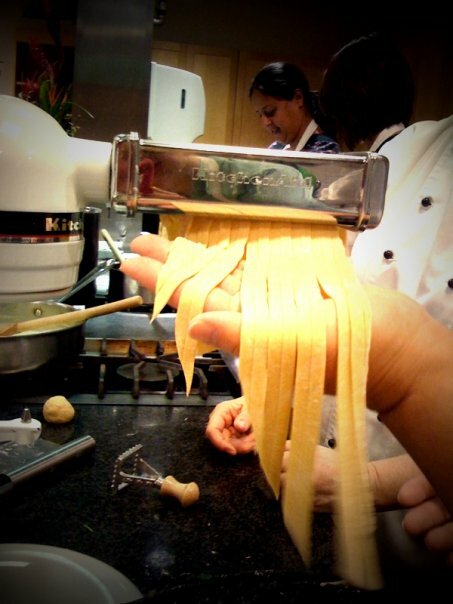 My experience with making fresh Italian pasta was educational and a whole lot of fun! I feel like I have an entire new set of skills to take home with me and I am very excited to put them to use. Check back for my next post when I put my new techniques to the test! Homemade Pizza and Pesto Pasta! Diana Krall is one of my favorite Jazz singers and musicians. Every time I listen to her I want to be whisked away to a quaint Italian restaurant in NYC or walking along the Seine in Paris. This is the type of music I love to hear when out on a romantic dinner date, or just as background music when cooking in the kitchen. Jazz music just sets the tone for me in a dinner setting, I love it! « Fall, football, and tons of delicious food! I love to eat pasta.I love lasagna even more.Do you know how to make plenty of Italian dishes?